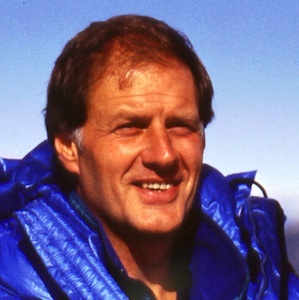 For over 30 years, John Amatt has led expeditions to remote regions of Northern Norway, Peru, Nepal, China and Greenland. He has explored areas of the Arctic on six occasions, making many first ascents of previously unclimbed peaks. At the age of 20, John spent two weeks lashed to tiny ledges while making the first ever ascent of Europe's highest and steepest mountain precipice - the 5,000 foot "Vertical Mile" Troll Wall in Norway. Later in 1981, he was the leader of the 1st Canadian mountaineering expedition to Western China, which made a lightweight ascent of 24,757 foot Mount Muztagata - the highest peak in the world to have been ascended and descended entirely on skis. More recently, John Amatt fulfilled a lifelong dream by organizing and taking part in Canada's first successful expedition to reach the top of the world - the 29,028 foot summit of Mount Everest, the world's tallest mountain. An educator by training, Amatt established One Step Beyond WorldWide in 1984 and he has since delivered more than 1,500 keynote presentations and seminars to total audiences of over 750,000 people in 35 countries around the world. His mission is to encourage people to push beyond their self-imposed limitations, to be more personally accountable for their own actions, and to embrace effective teamwork by valuing the contribution of others. John Amatt's best-selling book, One Step Beyond: Rediscovering the Adventure Attitude, articulates his belief that humankind must apply the spirit of adventure to the challenges of daily life, if we are to cope with rapid change and convert it to our own advantage. In his latest book,Straight to the Top and Beyond, he uses the metaphor of adventure to develop a nine-step approach for scaling the heights in today's unpredictable and rapidly changing global business environments. "John was an outstanding speaker – prompt, sharp, personable and highly accommodating. Combined with his stunning photos, John’s message riveted everyone’s attention to the stage. I can’t remember any previous audience following a speaker as intently as on this occasion."